Synthetic peptide within Human RNF23 aa 247-277 conjugated to Keyhole Limpet Haemocyanin (KLH). The exact sequence is proprietary. 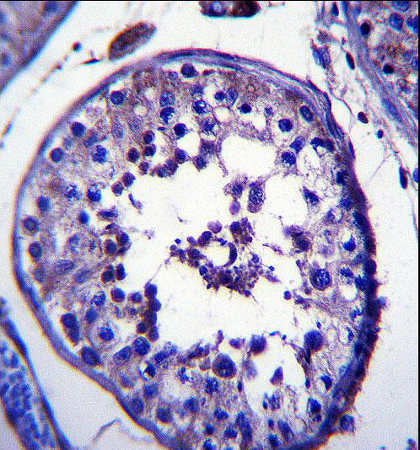 MDA-MB435 cell line lysates and Human testis tissue. Shipped at 4°C. Store at +4°C short term (1-2 weeks). Upon delivery aliquot. Store at -20°C long term. Do Not Freeze. ab172861 is purified through a protein A column, followed by peptide affinity purification. Our Abpromise guarantee covers the use of ab172861 in the following tested applications. WB 1/100 - 1/500. Predicted molecular weight: 60 kDa. May facilitate apoptosis by inhibiting the poly-ubiquitination and subsequent proteasome-mediated degradation of the pro-apoptotic protein MOAP1. Ubiquitous; highly expressed in brain, heart, kidney, liver, skeletal muscle, spleen and testis. Cytoplasm > cytosol. Mitochondrion. Found predominantly in the cytosol. Partial shift from the cytosol to the mitochondria when co-localized with MOAP1. Immunohistochemistry analysis of formalin-fixed paraffin-embedded Human testis tissue labeling RNF23 with ab172861 at 1/10 followed by peroxidase conjugation of the secondary antibody and DAB staining. ab172861 has not yet been referenced specifically in any publications. Publishing research using ab172861? Please let us know so that we can cite the reference in this datasheet. There are currently no Customer reviews or Questions for ab172861.